Bake 45 to 55 minutes or until toothpick inserted in center comes out clean. Cool 10 minutes. Loosen loaf from sides of pan; remove from pan and place top side up on wire rack. Cool completely, about 2 hours, before slicing. Cut into 24 slices. Wrap tightly and store at room temperature up to 4 days, or refrigerate up to 10 days. Most quick breads are removed from their pans to a wire rack. This produces a drier, crisper surface. If left in the pan, the bread would become steamed and soft. 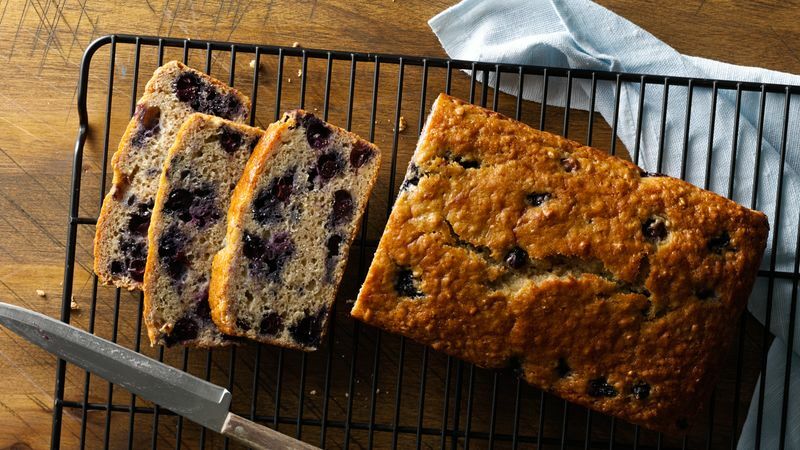 Try using fresh raspberries instead of the blueberries in this flavorful, moist bread.